The taxonomy of the snub-nosed langurs is somewhat muddled. For purposes of this post I am following the simplest arrangement. The genus Rhinopithecus contains four species, three of which live at high elevations (up to about 4,500 meters) in China and the Tibetan plateau. The Hanuman langer is spread widely throughout southern Tibet and Nepal, Pakistan, India, Bangladesh and Sri Lanka. They are medium sized to large monkeys getting up to about thirty inches long (not including their long tail) and weighing up to about 50 pounds. They are mainly quadrupedal and highly terrestrial. 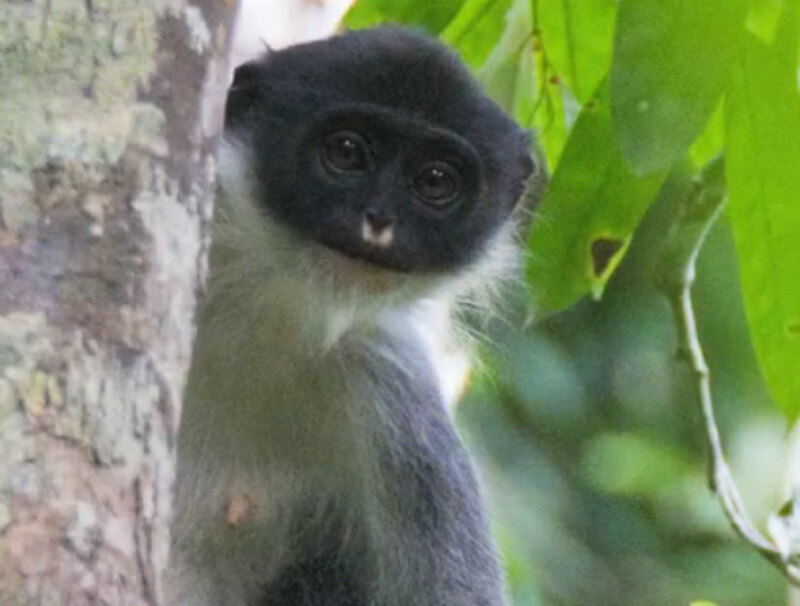 The mitred leaf monkey resides in the Malay Peninsula, Sumatra, and western Borneo. They are smallish colobines, weighing about 13 pounds, on average. They are diurnal and live in a wide variety of primary and secondary forests. Today’s primate is the proboscis monkey. The Simakobu, Nasalis concoor, was originally considered to be in a separate genus (Simias to be exact) will be discussed in a future post.